We are very proud. After months of hard work we can finally say: Tonight is the first edition of FORMAT #1. A group of 7 DJs will enter the room at club HOME in Noordwijk. FORMAT #1 is a new event with fresh tunes & classics. During the 90’s HOME used to be Discotheque De Bob, and Sergio Tee was one of the resident dancers at De Bob. Now Tee started the first conversations about FORMAT #1 with DJ Da Bar who was one of the resident DJs at De Bob. They wanted to start a big Reunion Party, and so was born the event FORMAT #1. The name is also the title of an early house record, from October 2018 the first posts appeared online with the title We Reunite!. Later on the poster and the trailers were released. And now it’s finally time to dance the night away with all the classic tunes by 7 incredible DJs. 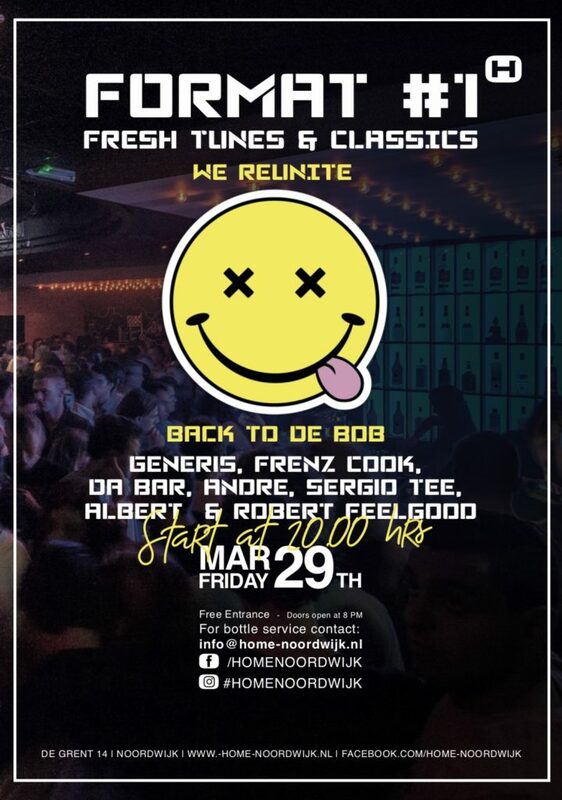 In the line-up Generis (Glam Club concept), Da Bar (De Bob, Noorwijk), DJ Albert (iT, Amsterdam), Robert Feelgood (Hed Kandi NL), Frenz Cook (De Bob, Noordwijk), DJ Andre (De Bob, Noordwijk) and Sergio Tee (Club Yolo, Amsterdam).